Action group 2 activates the Hub and 3 grabs science. Submitted by Jolly Roger Aerospace. Designed to fit in the requested space. Only 38 parts not counting the cargo bay. Includes antennae that will cover most distances, a servey scanner, solar pannels docking ports, science experiments, and the lab itself. Don’t forget the kerbals. They get a kick out of riding in a lab inside a cargo bay. 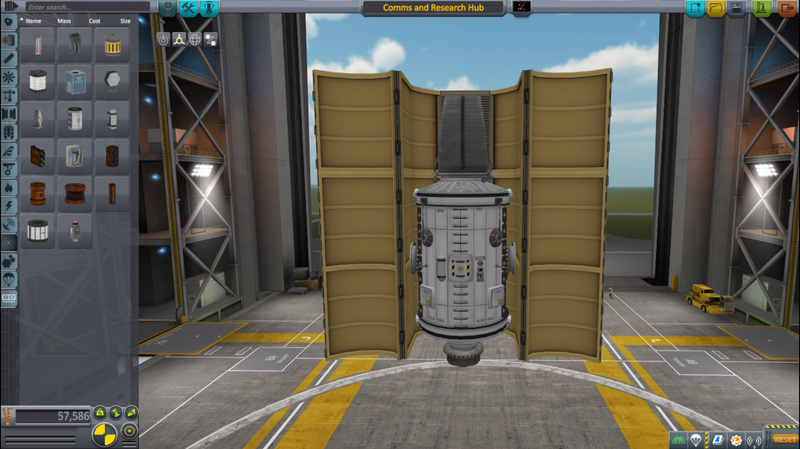 A stock rocket called Comms and Research Hub. Built with 40 of the finest parts, its root part is dockingPort2.